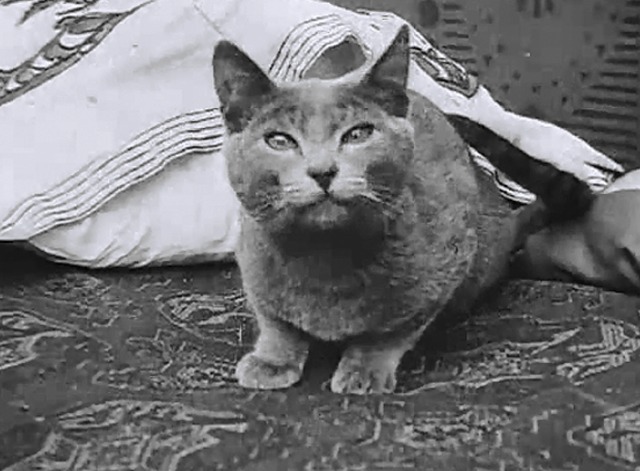 Could this Keystone short have been the inspiration for Sylvester and Tweety Bird cartoons? 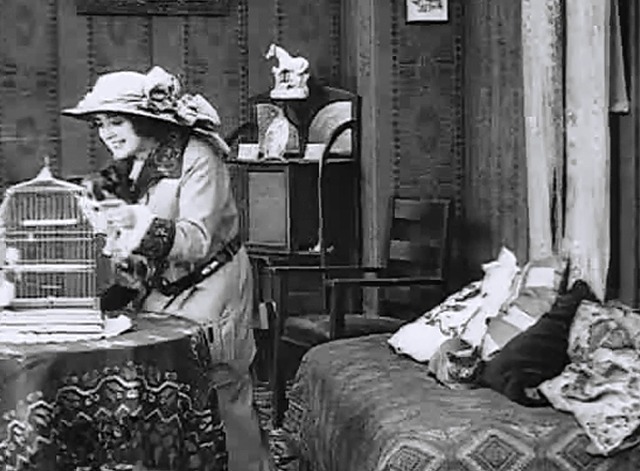 Mabel Normand is a young woman with lots of pets: a cat, a dog, and a bird in the cage. She’s very affectionate with her dog, and also pays a lot of attention to the bird, while the cat sits quietly on the couch, apparently happy to sleep undisturbed. Then she goes out, and the cat soon starts stalking the caged creature. The dog, seeing what’s coming, runs off to get some “friends” – a trio of much larger dogs – to chase the cat away from the bird’s cage. Mabel comes home to find the cage knocked over, the dog on the table, and the cat nowhere around. Somehow, she puts it together (I’d have scolded the dog for knocking over the birdcage, but never mind), and hugs her little hero. What’s remarkable in this film is their ability to use the animal actors so effectively to tell a story, when it’s clear that none of them are the kind of trained “stage animal” we’re used to seeing on screen (Lassie, Rusty, Boomer, etc). The cat, in particular, is being completely natural in its behavior, and the bird is genuinely terrified. The dogs don’t have much to do but run around, but they stay in shot and look determined (probably to get a tasty treat offscreen!). Given Mack Sennett’s frugal shooting ratios, we have to assume that there weren’t many “bad takes” and that someone had simply figured out how best to use the resources at hand. The Internet has some conflicting credits for this film, Some sources say Mack Sennett directed, some say George Nichols, who made some of Chaplin’s Keystone movies. The Silent Era splits the difference and says it could have been either. More perplexingly, some sources give additional human cast members, including Harold Lloyd. The only way this is possible is if there’s lost footage on the version I saw, because Mabel is definitely the only human I saw. It seems unlikely, because the story itself is complete, anything added would be superfluous. Still,I could imagine an opening scene where Harold gives Mabel the bird and tells her to take care of it for the weekend or something. Until I find another version, I’m sticking with the story that Mabel did a solo here.